We've followed plenty of controversies around drug trials, from ghostwriting to keeping quiet about unflattering results. But the latest news is particularly eye-popping: A prominent Massachusetts anesthesiologist allegedly fabricated 21 medical studies involving major drugs. Yikes. Baystate Medical Center in Springfield, Mass., has asked several anesthesiology journals to retract the studies, which appeared between 1996 and 2008, the WSJ reports. The hospital says its former chief of acute pain, Scott S. Reuben, faked data used in the studies. Some of the studies reported favorable results from use of Pfizer's Bextra and Merck's Vioxx, both painkillers that have since been pulled from the market. 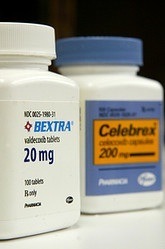 Others offered good news about Pfizer's pain drugs Lyrica and Celebrex and Wyeth's antidepressant Effexor XR. Doctors said Reuben's work was particularly influential in pain treatment and that they were shocked by the news. "We are left with a large hole in our understanding of this field," Steven Shafer, editor-in-chief of Anesthesia and Analgesia, told Anesthesiology News, which first reported on the retractions. "There are substantial tendrils from this body of work that reach throughout the discipline of postoperative pain management." Pfizer had funded some of Reuben's research and had also paid him to speak on behalf of its medicines. "It is very disappointing to learn about Dr. Scott Reuben's alleged actions," Pfizer said in a statement to WSJ. "When we decided to support Dr. Reuben's research, he worked for a credible academic medical center and appeared to be a reputable investigator." Wyeth said it wasn't aware of any financial relationship between the company and Reuben. Merck had no immediate comment. As for Baystate, it said a routine audit last spring was what flagged issues with Reuben's work. Reuben, who is on indefinite leave, didn't respond to the WSJ's requests for comment. But his attorney said Reuben "deeply regrets that this happened." The attorney also referred to "extenuating circumstances," but didn't elaborate on what they were. Take a look at Reuben's work here.